I want to share an encouraging moment from recent life: Our week started with a particularly upsetting episode for my 3 1/2 year-old daughter. She was at preschool and apparently came down with a spontaneous case of the rota-virus that is spreading around the school like wildfire. She had an accident which required a change of clothes and her cot cover...you get the picture. So I got the call at noon to come pick her up. She was upset, but she recovered. I subsequently caught the bug from her, and I recovered. It was time for her to go to school again. The FIRST thing she said to me that morning at 7:00 AM is, "I'm still sick. I cannot go to school." I listened to her, and asked a few questions, but went on with the morning, while she continued to insist she didn't want to go to school. The whining increased. I started to tense up, thinking, "We don't have time for this. She's too young to be saying she doesn't like school. Why can't we just have ONE morning go smoothly?" And then (and I think this is ONLY because I had been sick in bed the previous day, grading graduate students' homework on Adlerian parenting/Positive Discipline), I paused and said to myself, "I bet I can figure out what is going on here." So I made a guess. (I'm sure it's obvious to some of you veterans out there.) I said to her, "I know what happened on Monday was so upsetting and you were so surprised by that. I bet it felt a little scary." She instantly began to cry (the real tears) and nodded, saying "Yes, and I'm so scared it's going to happen again." She immediately calmed down, let me hug her and hold her, and I reassured her that her body was all better now and that it would not happen again. The rest of the morning was fine, and we got in the car and made it to school on time. No more tears. That afternoon, I told her she must be feeling so proud of herself for being so brave, but really, I was thinking, "Yay for me! I guessed right!” I slowed down long enough to listen to her! I didn't get mad! I validated her feelings. I didn't let the tension of hurried mornings get in the way of hearing her very real and valid fear!" She must have felt encouraged because she changed her behavior. After this experience, I am thinking back to a topic brought up in a recent parenting class. A parent expressed some respectful doubt that we could "guess" at the beliefs (and fears) behind the behavior. My example above is not necessarily a mistaken goal, and I know that it is not always appropriate or possible to do goal disclosure with our own children. However, orienting myself to the origin of her (at the time, very annoying) behavior, and combining it with some curiosity and calming down time for myself was magical! Click Here to download the NEW Mistaken Goal Chart which will help you discover the belief behind the child's misbehavior. 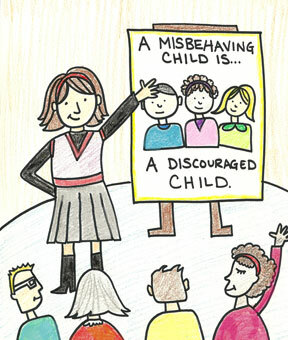 It is a new mistaken goal chart because it includes a column on "How Adults May Contribute" to the misbehavior. Watch this video from the new Positive Discipline Online Parenting Class for a further explanation of the Mistaken Goals of Misbehavior. We had just finished Vicki Dolan's Positive Discipline class at Children's Playroom in the morning. Most of it was review, but I picked up a few bits of information and one of the things I wrote down was "connection before correction." I haven't tried to implement that particular tool very often, but I had the perfect opportunity that night. 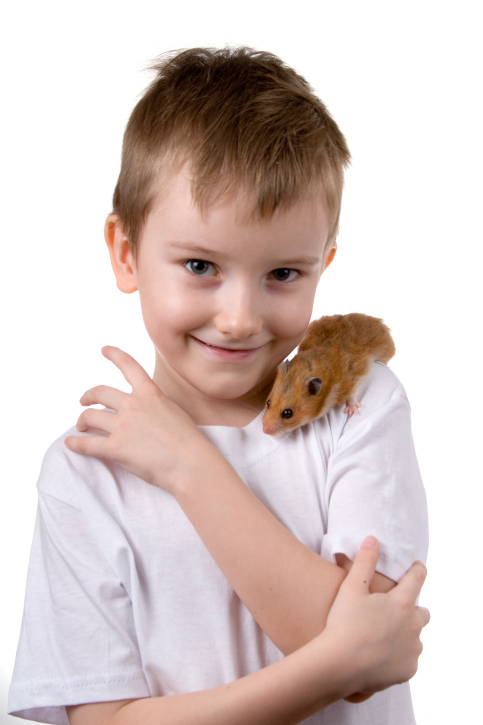 My kids were arguing over who was going to feed the hamster. My 9 year old asked my 4 year old to do it. He got frustrated and yelled, "I always have to feed him," and THREW the bowl of food all over the kitchen floor. My first thought was to yell at him to pick it up immediately and get nasty with him. But I thought I'd give this new technique I learned a try. So I very calmly held him in my arms and said, "You sound like you're angry because you are tired of feeding Niblet all the time." He grumpily replied "YES!" with a long winded explanation of how he always has to feed the hamster and he doesn't want to do it. I told him I could understand how it's frustrating to feel like you are always doing the work. He nodded. I then pointed out that there was hamster food all over the floor and it probably wasn't going to pick itself up. I asked him how we could get it off the floor? He suggested the vacuum; and I asked him if he wanted me to get it for him so he could use it for the food. He said yes and proceeded to vacuum up all of the hamster food. Amazing! I often say that Positive Discipline takes more time and effort and it's easier to be a mean and nasty parent! However, when I look back on this situation, I actually think I saved time and frustration by not yelling at him. If I yelled, he would have fought back and we would have been in a HUGE power struggle that could have lasted all night! Instead, I spent a few minutes making that connection and then he knew what the correction needed to be. It was a great tool to use! Positive Discipline works so well! It never ceases to amaze me! Thank you for the tools to be a good parent! Last year we introduced 52 Positive Discipline Tools in 52 Weeks. 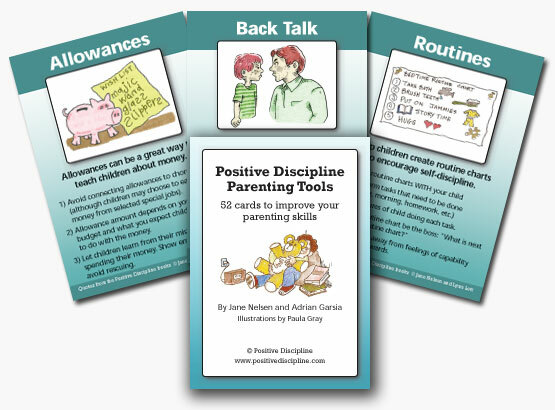 All of these Positive Discipline tools are amazing! But it can be overwhelming to try and apply them all at once. So this year we will share success stories that will inspire you as you read how others have applied the Positive Discipline principles. It is always comforting to know that others share the same struggles and read how they found solutions. We would also love to hear your own success stories. You can email them to contact@positivediscipline.com or join our success stories group on our private social network. Our first success story was printed in Parents Magazine. Dr. Jane Nelsen was interviewed by Francesca Castagnoli and she wrote an article titled The 22-Minute Discipline Solution. Read how Francesca has created a tradition of weekly family meetings and how her children look forward to what they call "Funday". Click Here to read the full article. This coming week we will be posting another success story featuring the Positive Discipline Tool of Connection Before Correction. Stay Tuned! 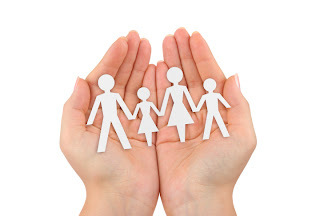 Attending a parenting class is a great way to help you implement the Positive Discipline tools. Having a group of like minded parents with the same goals and same problems will help you focus. Click Here for a list of local parenting classes. If you can't find a local parenting class, consider signing up for our Online Parenting Class. Our online class is the next best thing to being there in person. You get to participate vicariously as Dr. Jane Nelsen and her daughter Mary Nelsen Tamborski lead your through a six week parenting class. Watch the preview below. Click Here to sign up for the online class. Our free Positive Discipline Network is a friendly, encouraging Positive Discipline community. Questions are answered by members and Certified Positive Discipline Associates. You can join special interest groups, and you can do a search of topic that has already been covered to find support, encouragement, and ideas from other parents who are experience similar challenges. Click Here to sign up. 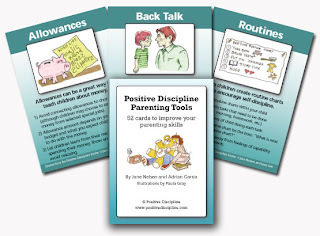 The Positive Discipline Tool Cards are a great way to have all the tools right at your fingertips. They are available as a Deck of Cards as well as an App for Android and Apple devices.